Use the Facilities Management page to add the account information for your organization’s facility management providers. 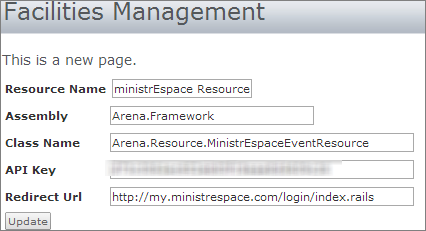 (Currently, Arena integrates with MinistrEspace.) Follow the steps below to implement this feature. 1. Add your organization’s MinistrEspace account information on the Facilities Management page. 2. Start the Updated Resource Events Agent. 3. Select MinistrEspace as the Event Resource for the Event Profile Detail module on the Event Tags page. Added a key setting to the Arena web.config to allow a max buffer size to be set for ESpace. The new setting is "<EspaceBufferSize" value="65536"/>". This allows administration to set larger buffer size values if they are experiencing problems loading large amounts of date with Espace.